article originally by John Gaines. 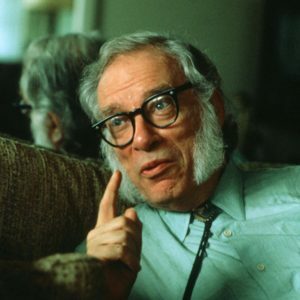 No discussion of twentieth-century science fiction writing can be complete without mention of Isaac Asimov, the biochemistry professor and visionary writer who was responsible for creating the popular characterization of robots and incorporating themes of social science into “hard” science fiction. His most popular works, the Foundation series and I, Robot, are considered landmarks of science fiction to this day. Asimov’s books provide both strongly entertaining narratives and adherence to detailed logical concepts and social themes, setting a precedent for quality science fiction writing. Asimov’s novels and short stories provide both exhilarating future worlds and troubling moral questions about the nature of humanity, the powers of governments, and the ethics of robotics. Asimov became interested in science fiction magazines at a young age while working in his family’s candy stores. He began writing his own stories at the age of eleven and started selling stories to the magazines at age nineteen. John W. Campbell, editor of Astounding Science Fiction, became his friend and earliest publisher. Many of science fiction stories were published in various magazines through the 1930s, but his first story that is still widely read today is 1941’s Nightfall. Instead of being a post-apocalyptic narrative, Nightfall illustrates the elements that cause a societal collapse. The planetary setting is constantly illuminated by multiple stars, and darkness is unknown to the population. Astronomers detect an anomaly in the primary star and begin with working with psychologists on a plan to condition the planet’s population to prepare for life in total darkness. However, instead of total darkness, previously invisible stars from outside the solar system become visible, and civilization falls into ruin due to an ancient belief that the emergence of new stars from darkness would bathe the planet in flame. The interaction between “hard” science, social science, and religious/mystical belief would go on to form the cornerstone of one of Asimov’s most highly regarded works, the Foundation trilogy. The Foundation trilogy’s central philosophical concept is called “psychohistory,” which is a mathematical means of predicting the behavior of groups of people. Coined by the mathematician Hari Seldon, one of the story’s central characters, psychohistory is based on the principle that a very large group of people’s behavior is predictable based on the size of the group: the larger the group, the more predictable the behavior. Seldon uses mathematical equations to predict the collapse of the Galactic Empire, which spans the entire Milky Way, and the subsequent fall of human civilization to barbarism. Unlike most science fiction stories of the time, which tended to use the progression of their imaginary civilizations as allegories for modern events, the Foundation books track the progress of society over a much longer period, using events and actions that were not inherent allegories for the time in which they were written. Asimov’s basis for the initial stories was Edward Gibbon’s The Decline and Fall of the Roman Empire, but the Foundation books go far beyond it in illustrating the end and subsequent renewal of civilization over a time span of thousands of years. The series proved so popular that Asimov decided to continue it with two further novels, Foundation’s Edge (1982), and Foundation and Earth (1983). In addition to Foundation, Asimov created I, Robot series, in which Asimov created a unique programming system that made his robots different from all prior portrayals in science fiction. Before Asimov’s Robot books, robots were frequently treated as either mechanical menaces or mindless slaves with no free will. Asimov’s robots, which always have positron brains, utilize Three Laws of Robotics that control their behavior: that (1) a robot must not injure a human being, or through inaction, allow a human being to come to harm, (2) a robot must obey any orders given to it by human beings, except where such orders come into conflict with the First Law, and (3) a robot must protect its own existence as long as such protection does not conflict with the First or Second Law. As long as these Three Laws of programming were obeyed, Asimov’s robots were allowed free will and the capacity to think, reason, and (in one story) to dream. Several of the short stories in I, Robot were adapted for a screenplay by Harlan Ellison, but the film was never produced, and the script is only available in the form of I, Robot: the Illustrated Screenplay in 1995. A film version starring Will Smith was released in 2004. Although this film was based off of a script called Hardwired rather than the Asimov/Ellison screenplay, it was rewritten to incorporate the Three Laws and other concepts from Asimov’s work. Asimov’s robots, while grappling with the Three Laws in their quest for humanity and higher thought, make for some of the most compelling narratives in science fiction. Asimov’s drive to create new philosophical concepts and push the boundaries of science fiction narratives demonstrates his extraordinary creative ambition, as well as his creation of a universal history that spans millennia. Isaac Asimov is one of the 20th century’s great authors, and his work is some of the best science fiction written.